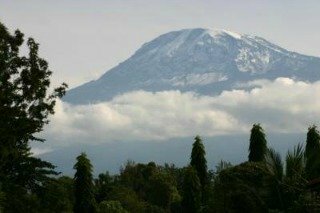 Senior Trekking Kilimanjaro is an alternative holiday option for the active over fifties seeking adventure, novelty, and culture. I first saw the snow-capped peak of Kilimanjaro in 1969. As a callow youth, on my way to work in Zambia, I could scarcely have imagined the significance that iconic mountain would hold for me more than forty years later. In July 2000, I made a tentative phone call to Pat Falvey, one of Ireland’s great modern adventurers, to ask about joining him on a trek to Mt Kilimanjaro. He suggested we climb Ireland’s highest mountain, Corrán Tuathail, the following weekend, to test my suitability. It was a disheartening experience. My legs ached, I was sweating and short of breath, I needed several rest breaks, and I struggled to keep pace with the other walkers. 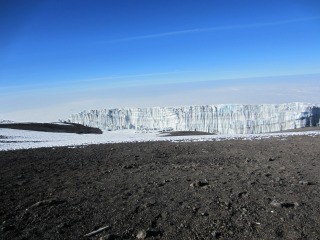 It discouraged any notions I had about myself as a hill walker, and Kilimanjaro seemed way beyond my capability. I was 53, too old for adventure holidays, I thought. And yet, sometime later, I joined the Lee Valley Walking group, and after several more encouraging walks, I was hooked. I secretly held onto my dream of climbing the world’s highest free standing mountain, Africa’s highest peak, Mount Kilimanjaro. In June 2012, I went on a walking holiday to the Lake District , which included climbing England’s highest mountain, Scafell Pike. That completed my goal to climb the highest mountains in England, Scotland Wales, and Ireland. I was ready to recommit to the most challenging item on my Bucket List. I signed up for the September trek; lead by Pat Falvey, and from that moment I was focused on the summit. I would frequently remind myself that once I took my first step on that mountain, I was going all the way to the top. The apex of Kilimanjaro, at almost 6,000 meters, is classified as extremely high altitude, so the risk of altitude sickness is part of the challenge. Subject to that, it can be accomplished by senior hill walkers with a good level of fitness, as no technical climbing in involved. The excitement and anticipation on day one was palpable as twelve trekkers registered at the Macheme Gate- with nervous banter, final gear check, and repeated trips to the toilet. A remarkable feature of the seven day journey was that it took us through five different ecological zones, with unique vegetation and biodiversity, viz Cultivated lands, Rain forest, Heather and Moorland, Alpine Desert, and Artic, And every day brought a different vista and challenge. We had long walks and short walks, uphill and downhill, gradual and precipitous, cold and cloudy, hot and sunny. 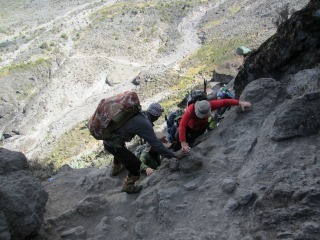 The final ascent from Barafu camp at 4650m, which began at midnight, was by far the hardest part of the trek. We were 1245m from the peak, and as each step took us to higher altitude, the temperature fell below zero, the air got thinner, and my drinking water froze. I had five layers of clothing, and still I felt cold. Walking in darkness, we couldn’t see the endless crisscross trail on a steep slope of unstable broken rock fragments, formed by weathering and ice. The trail got steeper still approaching Stella Point, which is about an hour from Uhuru peak. After about five hours the most welcome sunrise ever warmed our hearts, revived our spirits and gave us the energy to push on. 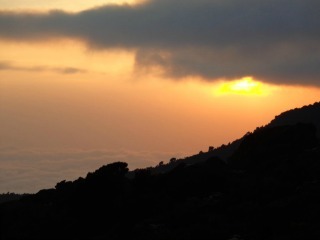 We were high above the clouds and the horizon was a dazzling radiant orange. The journey from Stella Point to Uhuru Peak, on the black volcanic earth of Kibo’s crater rim, took us past ice fields and what’s left of the blue walls of rapidly retreating 12,000 year old glaciers, poised to disappear by 2030. This was the most exhilarating part our trek, because we knew for sure we were going to succeed. We had other trekkers for company, some of whom were leaning on their walking poles, gasping for air, barely able to support themselves. And we met cheerful walkers returning from the summit looking quite unruffled. And we happy few were quite untroubled as we approached the bright green and yellow metal sign, which has replaced the iconic wooden one. ‘Congratulations, you are now at Uhuru Peak, 5895m, Tanzania, Africa’s highest point, the world’s highest free standing mountain.’ I touched the sign and said a silent prayer of thanks, grateful for the health, energy, and support which enabled me to fulfill my dream. My recollection of the summit is somewhat blurred by the sense of disbelief that I really was at the highest point in Africa, awed by the majesty of the surroundings, and exhausted from lack of sleep, the altitude, and the effort of the climb. With smiling happy faces, handshakes, hugs, and photographs, the cold and fatigue was forgotten, and we somehow found the energy to dance and sing! 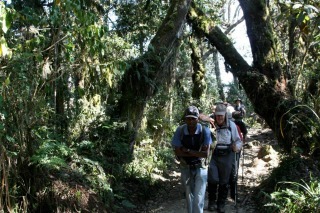 Why might you consider Senior Trekking Kilimanjaro? Perhaps for the adventure and the challenge, and to answer the question, ‘would I be good enough’. You might also go for the stunning scenery, the African culture, or maybe the dream of standing at the summit of the world’s highest free standing mountain is on your Bucket list. Above all, do it for the sheer joy of it! Those of you who have the desire and courage to search for adventure will eventually find it - and when you do, how will you react when someone somewhere someday says ‘let’s go’? 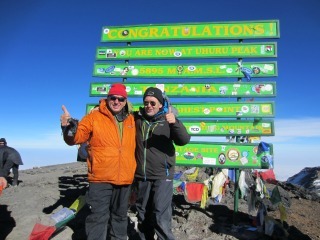 My Senior Trekking Kilimamjaro adventure was with Pat Falvey, one of Ireland’s great modern adventurers.